Canadian startup Freightera released its breakthrough redesign. Shippers can now get instant freight quotes without creating accounts. VANCOUVER, British Columbia, Sept. 7, 2017 – Just in time for the busy fall shipping season, the Canadian startup serving businesses with instant freight quotes and online bookings unveiled its break-through redesign. Freightera users can now get live instant quotes without creating accounts. The new site for the first time offers quotes and booking on mobile devices. Freightera also opened the first lanes automating refrigerated less than truckload and full truckload freight. “Our entire team is excited about the new Freightera. Customers can now start quoting process on the homepage, just like Expedia. Our website became stale over time, as we’ve focused on growing the business first, but we’ve always wanted to offer our customers a more enjoyable experience and improved usability. Earlier this year we partnered with an award-winning design firm and are pleased to share the result of collaboration,” said Eric Beckwitt, Freightera CEO. The 3-year old startup is moving fast. It has over 5,000 registered business freight shippers and the best lane coverage and rates in Canada and the United States. Over 9 billion automated rate quotes in Freightera’s inventory connect 23,000 communities. Freightera started in Canada and cross-border US-Canada transport and is rapidly expanding in the United States. Among other recent achievements, in its Silicon Valley debut, Freightera won placement in Plug and Play Ventures’ Supply Chain and Logistics Accelerator. The program was initiated by Plug and Play at the request of their corporate partners to meet the need for innovation and cost optimization in the sector. Partners and attendees on the finalist selection day included senior executives from Walmart, BASF, Maersk, CMA CGM, Union Pacific, Honeywell, Prologis, USPS, DHL, Deutsche Bahn, DB Schenker, Ericsson, Nestle, Panasonic, Colgate-Palmolive, Deutsche Bank, Munich Re, Sony, PSA International, IBM, PepsiCo, Goodyear, Sherwin-Williams, and Daimler. Freightera’s goal is to create a single, unified global marketplace for freight, reducing shipping costs while at the same time significantly decreasing air pollution through optimization and new technologies. This redesign will help Freightera to open container shipping and other modes of transport in the near future. Freightera is creating a unified global marketplace for freight transportation. 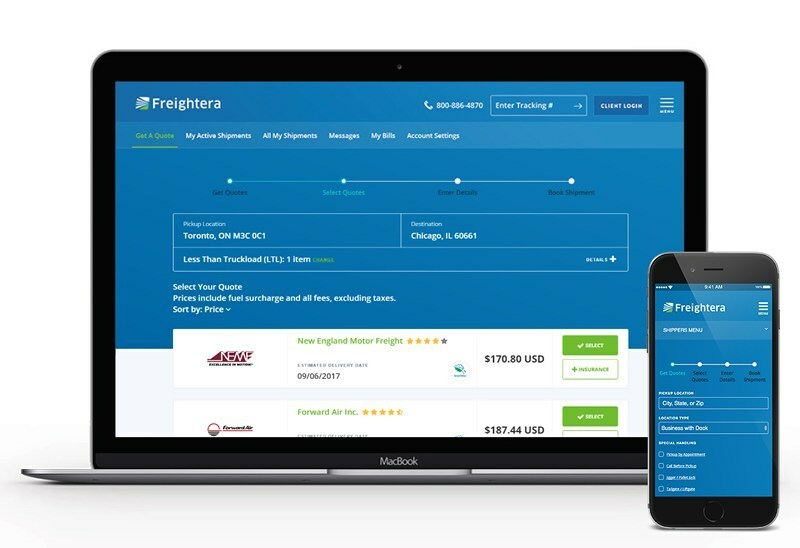 Starting in North America, Freightera is automating freight transportation and increasing operating margins for carriers and businesses shipping freight. Freightera creates partnerships and systems and promotes new technologies that allow business to find the best price and lowest emission transportation options. Over 5,000 manufacturers, distributors, wholesalers and retailers in the US and Canada use Freightera for 24/7 online access to billions of all-inclusive freight rates and instant freight booking. For more information, see www.freightera.com.